The Wiegands: co.sleeping, bottles and more. This one could be a long one. I have had quite a few people interested in a post on co.sleeping. Why we do it, how it works. This NOT a post on what is better or a big post about why everyone should co.sleep...this is just simply our story. Let me start off by saying that we have coslept with Aiden for 2 and half years but have not co.slept with Ains (I will elaborate on this throughout this post). But we know both sides extremely well. I totally get why co.sleeping is awesome for some and doesnt work for others because within our family we have one of each! I also wanted to say Chris and I both see life very uniquely. This would never have worked if we were not both on board. Cosleeping is great if it doesnt affect your relationship or children negatively. We know our babies are small only once. For us (both very sensitive souls) this is a delicate time we will not get back...so if any or all of our children wanted to sleep by our side, we will always be all for it. We have watched friends lose children, friends die, friends little ones get cancer, friends get in life changing accidents... when you walk through tragedies in your own life or with people that you love, it will change your life. It will change how you look at your life. I know people have lots of opinions on the issue- I am not saying anything for either side, just simply our story. Everyone has to do what is best for their family and for their kiddos....and the truth is, no one knows that except for you! I think you need to do what will keep you rested in the midst of the craziness. And that may look different for all of us. Even within our own family that is the case! I was in 3 weddings when I was pregnant with aiden and 2 more when I was pregnant with ains... if that tells you the differences of stages my friends and I were in. When I had Aiden I knew very very few people with babies. I went into labor with Aiden a month early. Not only was in early labor, he was stuck in my pelvic bone. It would be physically impossible for me to ever deliver a baby unless by c.section. It was late at night, I was drugged, emotional- they pulled him out and there was complete silence. I will never ever forget that. He came out blue and silent. I kept waiting for the scream, the crying....but nothing. I was behind a curtain and unable to really see what was going on. They brought him over to me and placed his face by mine, I remember kissing his little nose and then they took him away. No laying on my chest, bonding/crying, kissing, snuggling. No friends and family coming to the hospital to meet our new little man. Nothing. He was far away, wrapped in wires- being taken care of by people I didn''t even know. This sounds very naive, I know...but I didn't even know that a NICU experience was a possibility. It had truly never crossed my mind that something like this would happen. My emotions and hormones were completely out of control. I was soooooo so sad. I felt like no one understood. People kept wanting to come to the hospital and I remember just being furious. I didnt even get to see Aiden without permission, why would anyone want to steal those moments from me. I had to ask permission to touch him, permission to change his diapers. It wasn't me helping him/bonding with him- it was his nurses. I had my first and only panic attack in the hospital that week. I remember laying on the hospital floor, not being able to breath, crying my eyes out in a complete and utter mess. The day I was supposed to leave the hospital the woman came to get me in my wheelchair and asked where the baby was. I cried and cried. and honestly almost threw something at her. I was seriously not myself at all. And I felt alone. We both felt alone (Chris and I). I remember someone coming to drop off a meal at our house and they made a joke about Aiden (who was still at the hospital)- it hit me then how alone we were. People couldn't relate to what we felt like. Finally weeks later when Aiden came home, we were in desperate need of gaining back all that lost time. Not only that but for days and days we had watched monitors.... I knew what was "good" breathing, "good" heart rate...then suddenly we were home and had no monitors. I can remember Chris and I just sitting up at night watching Aiden's chest, just praying he could breathe. Praying his lungs would not fail. We had never been with Aiden for more than a couple hours at a time, so once we got him home we put him right by our side and never ever wanted him to leave. I will be the first to admit, if we had put him in his crib the very first night we came home from the hospital he may not have wanted to sleep with us. But we didn't due to some crazy circumstances. So I will never know. Life throws us curve balls, I just try to roll with them :). Chris and I are both such sensitive souls. This was painful. We were in a race to gain what we lost. There were various times in the first year we tried to move him to his crib to see if he was ready but it just didn't work. We all slept great when we were together. And we dont believe in crying it out/ feel comfortable with it. We all slept so good when he slept in between us, it just worked. Also, the 3 of us have similar sleep rhythms. None of us move around. We barely know he is there. Like I said, it just worked great. Plus it is so easy...if he woke in the night I would just pull him to me- I could instantly meet his needs. In the grand scheme of all of our lives the portion and time that our children are small is so tiny... we are able to grasp that. This is just a season, and before we know it, it will have passed. Then a couple months after Aiden's first birthday we decided (since ains was coming) that we would move him into a big boy bed in his own room. We were prepared for another little one who loved to sleep with us. That was hard. He was used to sleeping with two warm bodies that he loved and he did not want to go. Most nights we would trade off sleeping in there with him just to try and get him to like it. The truth is, we knew he wouldn't be 15 sleeping in our bed....and that when he was ready he would pull away. And we wanted to meet his needs until we got to that point. So when Aiden was 18 months old, I went into early labor again ( a month early) with Ains. I was 6.5 cm by the time I got to the hospital. We had the same experience again. She came out blue, not breathing. 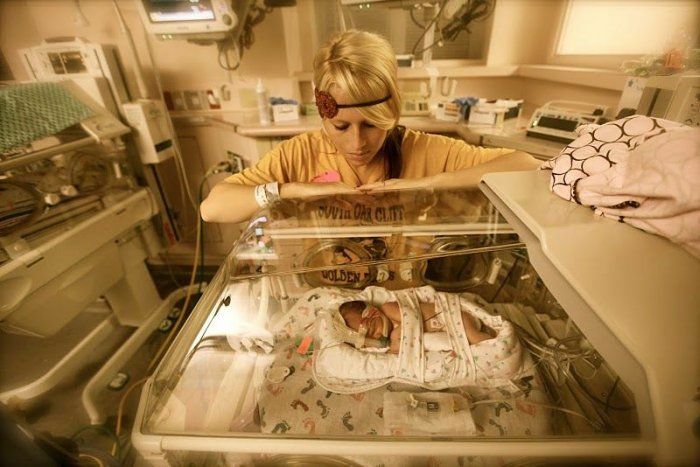 She was immediately taken to the NICU. But something was different this time. I had emotionally prepared myself that this may happen again. I knew that we would get those moments back (I saw that we did with aiden). Also, if I am being completely honest I was going through some incredibly painful and messy stuff in my personal life (that I have never blogged about) and everything was a bit of a fog. We came home without Ainsleigh. Then weeks later she got to come home. I noticed right away she was different than aiden. She didn't like to be in the same room as us for sleeping at night. She wanted to be in the dark, in the quiet, in her own space. We wanted to meet that need. It's amazing how well you can know your child from the first moments. I have always thought that I am good at getting in rhythms with my babies. I know what certain sounds mean what, I can anticipate things....I just have been very in tune with them both from the first moments. So we gave her what she wanted- she slept in her big girl crib, in her own room. Ains has always been an amazing sleeper. So after much thought and conversation Chris and I decided to try dropping Aiden's nap- just to see what would happen. And much to our surprise, he didn't miss a beat. He has been going to sleep in his own bed at 7 or 8 pm and most nights sleeps all night in there and other nights still creeps down the hall to our room around 4am, which is fine! There will be a day when he never ever does this again. And we will miss it desperately. We waited until Aiden was ready to start transitioning him. We tried a few times before...realized he wasn't ready. 1. how do you all fit? We have a king sized bed. 2. When/How do you incorporate time with your husband? I always wondered that for co-sleepers! Chris and I always smile at this :). We have many open rooms in our home; if Aiden is asleep in one of them, we just hangout in a different room. Sometimes we move him into his own bed so that we can be in our own room together (then he would just join us later when he woke up). When we decided to let Aiden cosleep with us, what came with that decision was the need to be creative. I can imagine when you have teenagers you have to be intentional just like when you have little ones you must be intentional. It just all looks different. I promise you this is not an issue whatsoever. a bed is a bed. And we don't look at the actual mattress in the biggest room in the house as sacred :). Like I said before though, you and your husband need to be on the same page. If you co sleep and your husband doesn't agree - then you truly are choosing one family members needs over the other. And thats where I personally would say to choose your husband. But hopefully you will see eye to eye. 3. Do you have suggestions on how to successfully co-sleep, where you feel rested as well! If co.sleeping had been frustrating, tiring, etc we would have figured out something else. For whatever reason Aiden does not move around or wake up if he is with us (it is when he is in his room that he wakes up multiples times) so for us personally it was a way for us all to get the best rest! 4. I would love some ideas on how to respond to people who are anti co-sleeping... who always feel the need to criticize our choice. 5. When is the right time to transition? I think it is probably different for everyone! 6. why not teach them how to sleep? For various reasons we do not feel comfortable with our kids ever crying it out. Both Aiden and Ains have never cried it out and both sleep all night. One with us (sometimes) and one not with us. We just let them move at their own pace. Whatever each of our little one's needs are...that is what we will meet. 7.Did you also try to use cribs or bassinets for the children? Yes, we tried transitioning Aiden a few times and he was not ready. Now he sleeps in a big boy bed. And Ains has always slept in a crib. 8. how do I stop my son from throwing everything in sight behind our headboard? I have no idea! We have quite a few pasies behind ours as well :). 9. When do you plan on transitioning them to their own bed? Research shows that co-sleeping moms are more aware of their child's wakings and movements. Also, many other countries in the world don't even have cribs. And you have to think in the big scheme of the world....babies have been sleeping with their mamas since the beginning of time. 7. I'd love to hear more about your choice to keep them on bottles through their toddler-years. What influenced your decision and how do you feel it has affected them (both positively and negatively if possible). :) Thanks girl! Both our kiddos around 6-8 months started drinking juice and water from sippy cups, and around one years old even drinking from real cups. They both use forks and spoons and feed themselves. I just never understood why it was a big deal for them to stop drinking milk from a bottle. I knew they were drinking all other liquids from cups and sippie cups and if they wanted their milk from a bottle we were fine with that. We don't let them have bottles in the night, so it's just when they want them in the daytime. I figured that back in the "old days" they didnt have sippie cups and kiddos drank from bottles, so why is it a big deal now:). Plus both our babies really love milk and it is good for them! Also, I know they wont be 5 years old drinking from bottles...so for now.. I am just letting them be little- taking their needs one day at a time! 8.What are your thoughts on non co-sleeping families, AKA my family and how I will most likely raise my kids? How do you respond to people who choose other ways than you do? How would you hope that people of different parenting styles would choose to respond to each other? Well since we cosleep with one and dont with the other I feel like we can see and fit with both sides. If I only had Aiden I might be on one side. or if we only had Ainsleigh we might be on the other side...but the cool thing is that we have one of each...and to Chris and I, doing what is best for us and for each of them is what we want! Even if that looks different with each child....just like it looks different with each family. I really do wish people would be more loving. Just understand we are all different. And be okay with that. Being honest, I am very sensitive to negativity. A year with this blog has taught me a lot- I get people who just spew hate at me...and I don't understand that. I hope to love well. I want to understand other people. The last thing I want to do is just spew out hate and negativity to people, especially people I don't know. 9. Very honestly think co-sleeping sounds exhausting...is it? It might be for some people. If it was for us, we wouldnt have done it. The reason we did it was because that is how Aiden slept peacefully all night. I will be the first to admit, if we had put him in his crib the very first night we came home from the hospital he may not have wanted to sleep with us. But we didn't. Due to some crazy circumstances. Life throws us curve balls, I just try to roll with them :). 10. How do you and your hubby instead show your kids that your relationship to each other comes first? What boundaries or actions do you two practice that shows them that that is your commitment to the family, to each other?/ How do you communicate to your child that daddy comes first and they are after him? I love my kids (we all do here), but when my kids are there, my husband and I both focus on them and not one another. I want to make sure they understand that they are not the center of my universe. They are a huge part of it, but not the center. I think that showing your children that your spouse comes first just by a night routine or sleeping just the two of you in a room as = to daddy coming before babies as limited. Showing our kids that our marriage comes first is much much bigger than that. I really think if anyone came into our home and saw our family unit for any period of time that question could be answered based on actions. One of the greatest gifts we can give our babies is a beautiful, thriving marriage. Chris pursues me, we go on date nights, we are affectionate, the way we interact, the way we react to each other in situations and love each other...these are just a few examples of ways we can show our children our commitment to each other. Chris is home with us all day. So we have the entire day to show this to them. As they get older we will have conversations about that. And as they get bigger, I think more boundaries will come into play. And changes will be made. If your husband is sleeping on the couch, I would personally say that co.sleeping isn't working. I would also admit that the first year of Aiden's life I made some mistakes. and learned quickly. God comes first...then Chris...then the kiddos. My gift to these babies is a wonderful marriage. They need to know that. 11. What do you do if your child doesn't ever want to move to his or her own bed? I guess I can't really answer that because I haven't been there. If Aiden was 13 years old and wanted to still sleep with us then I can understand that being a problem. I guess we just look at 10 years out of 100 a small fraction....if for a time they need to sleep with us, that's fine. "Living your life to get that deep God-like validation from your peers is a scary place to be in. If someone threatens your sense of self and questions your choices, watch out. "on Christ the SOLID ROCK I stand. All other ground is sinking sand..." Basing one's self-worth on the opinions of the masses is nothing but sinking sand." If you feel defensive or angry, just die to that. I am also doing this. I want to see that everyone has different stories and that there is a "best way" that may look different for each of us. Don't seek peers for your validation, stand firm in your own decisions. ... Chris' grandmother passed away this week. We had the viewing tonight and have the funeral tomorrow. Driving home I was thinking about the beautiful video that played (that she never got to watch) and all of the people saying things to her "things they wished they had said." It got me thinking... if you lost your spouse tonight...or your babies- what would you wish you had done. Because whatever it is.....go do it now. If you wish that you were more gentle or more cuddly....or more forgiving, slower to react, a better friend....whatever it is- go do it. I'm sorry to hear about Chris's grandmother. What an awesome post. Thank you for sharing. I never thought that I could cosleep, but maybe we'll have to try it out for a while. We'll just have to see. I tend to roll/turn a lot, so it might be challenging. You handled this so gracefully. I can't imagine being in your situation at the hospital with that nurse though. Unfortunately I probably would have reacted the same way and possibly worse. I can't imagine having to leave my baby at the hospital as I went home. I'd be devastated. "If you feel defensive or angry, just die to that. I am also doing this." This is such great advice. We are planning a home birth and have faced a lot of opposition and for me it's been challenging to handle questions/opposition with grace and not become defensive. Thankfully God has calmed me down in this quite a bit, but I still have times where I realize I'm not showing others the grace He has shown me. Oh, conviction how sweet you are to the Christian walk. love love love this post! my husband and I just adopted a little boy who is 5 months old and we were SO prepared to co-sleep and bond and love on him all night. turns out he loves sleeping in his crib and totally soothes himself to sleep with his paci. It really is about being in tune with your childs needs and knowing yourself as an individual and a couple. the internet needs more non-judgemental, caring, & open-minded bloggers like you :) you are a great momma to your kids and a great wifey! ps. my little sister had her bottle till she was 4! and she gave it up when she was ready and turned out just great! Prayers for your husband and his family as well. Such an amazing post! I loved this. You are so inspiring no matter what you blog about, your passion for life and your kids and how you raise them and about God just shine straight out of you! My prayers are with you all and his family for the loss of his grandma! Your words are so beautiful and encouraging. It is so uplifting to see anther family who embraces both co-sleeping and crib sleeping too! It is so encrouaging to me to see how graciously you handle both sides, and your story of your babies births bring tears to my eyes. I am so sensitive to those kind of things, and what you have gone through is just amazing to me! You are a strong woman! And thank you for the reminder to "do it now". I look forward to your blog posts every day! Keep up the good work-God is using you! Thank you for your post! I love hearing your point of view and perspective. I have never heard anything "good" about co-sleeping. Glad to hear about your experience with it. I've been following your blog for a few months now. Thanks you for sharing this...I"m not a mom yet, but hope to be! But beyond that, thanks for sharing your honest words, and for being loving towards others & allowing God to love through you. I admire your honesty, and your pursuing after God. He's using that, and I'm praying God continues to encourage your heart as you blog and show Him to others. what an amazing post casey!! we hadn't planned on co-sleeping with our baby once he is born, but who knows, that could totally change! i really enjoyed reading about your experience with it and def think you did what was best for your kids!! Thank you for this. Truly. Especially the end. Today was a very rough day and I was not the mother I want to be to my 3 sweet girls. After reading this, I was humbly reminded how fleeting life is with small kiddos. I am happy to say that I turned it all around by gathering up my babies and loving on them until they fell asleep. God Bless you Casey. Gods spirit is so present in your words. Why do you always gotta make me cry? I love this post. Everything about it. The information, the love, the heart that is so vulnerable. thank you girl. If you haven't heard it today you must continue to share your heart with this world. You are a light! I am so glad you wrote about this. I loved reading it, too. Bed Sharing is definitely a natural way to sleep with your child, and if that's how everyone sleeps their best, and is happy, then why not do it in a safe manner? My daughter would much rather be snuggled up with me then sleeping in her pack n play right next to my bed. Until she was about 4 months old she wanted to sleep by herself, and now she won't have anything to do with it. These tender moments a limited, so my husband and I will take as many of these memories as our daughter will let us. She'll transition when she's ready, hopefully I'll be ready at that time also. I'm in no rush. Casey, this post was so great. I never really knew of co-sleeping because I am not a mother yet and my mother always worked night shift when I was a little one. It is very interesting to me and I love how you encourage families to do what works best for them, even though that may look very different from your friends, siblings or peers. Also, I think it is easy for people to have an idea of what they would do, but until you are in that situation, you really have no idea. Some of the people that are defensive to the idea now, might completely change their minds when they have a new baby with a different personality and different needs. I also love how you reminded us all to love our loved ones while we have the chance. This has really been on my heart lately and I think often about the quality time I get to spend with my family. Time really is so short. I love your blog. I recently found your blog from a giveaway on another site and it has been such an encouragement to me! You make me want to be more loving and peaceful and each of your posts brings light to my day. I can't wait to continually read what you have to say. I've thought about co.sleeping, but know that since Hubby and I both roll, kick, thrash, and squirm in our sleep that it would probably not work for us. This kind of makes me sad, because I tend to think it's such a sweet way to get close to/bond with your child, but, like you said, different situations and different people require different things! This post really touched me. Not so much about the co-sleeping (my kids all sleep in their own beds now) but about your spouse coming first. That is something I really struggle with. My husband and I have been through challenges and because of that, I often put my children above him. Thank you for reminding me of the need to put my spouse first and show my children they are in a solid loving family. i've never thought of this before, but i can definitely see how you both would want to keep them so close. they are just too precious. i think you both are rockin' parents and are doing everything you can to raise your children the way you want, which i totally respect!! best post you've ever written. ever. thank you for sharing your experience Casey!! The key here is that every child is different, and where I think we err as parents is trying to force ONE approach and philosophy to parenting our babies to ALL of our babies. It doesn't work. All it does is frustrate you and the baby's needs are not being met. My 1st child, a boy, who is now 11 was the perfect Babywise baby. He responded to that technique perfectly. We did have some cuddle time in the mornings around 6, but that's it... I swore by Babywise and thought all other approaches were inferior. My 2nd child, now 3, was the CLASSIC AP HIGH NEEDS CHILD... that I tried to apply the Babywise approach to. Then she would not settle at night no matter what we did. We tried EVERYTHING... Ferber, disappearing chair, cry-it-out, Sleep Solution... EVERYTHING. And I am telling you, she had no breaking point. I feel so bad that there were times I let her cry too long, looking for her breaking point. The only thing that solved the problem was bringing her to bed with us, nursing her to sleep, and co-sleeping. So we just adopted that as our way of parenting her. Eventually we got her a big girl bed and she would go to sleep in there as long as someone laid down with her. She is still that way now. My 3rd child, a boy, now 14 months, well, as soon as he came out of the womb I was holding him non-stop, and we co-slept from day one, simply because I wanted to be close to him. Turns out, he is happy just being laid in his crib to go to sleep, no crying, nothing. Totally secure and happy. He does wake up in the night and want to lay down with us and snuggle, but goes right back to sleep, and I cherish that SO much! I understand many people want control over their childrens' schedules and sleep habits but trying to control them with a singular approach and then neglecting their needs when they cry to tell you that they need you is something to examine oneself about... what are your motives, etc. casey i have so been looking forward to this post. thank you for letting us see into this special part of your lives. i loved sleeping with the babies. some nights just warranted that. i remember our first night in the hospital with wilder...he slept in the boppy pillow right on top of me. and i loved every second. i will do things differently with our 3rd baby, if God blesses us with one...like i WILL rock him/her to sleep, and probably Won't do cry it out!! probably because i know he/she would be our last. we all love you, casey. you have a little "fan club" here in wichita. also i'm sorry about Chris's grandmum; it sounds like her ceremony was powerful. Such a great post!! Our little girl is 14 months old and we are just starting to transition her to her own crib. She has co-slept with us since she was 4 months old and it just worked SO much better for everyone. She is a really sensitive child who takes comfort in touch and sleeping with us makes her SO happy and comfortable that she is literally happy all the time. As a working mom it helped ease the gap of being apart so much during the day and allowed everyone to sleep better at night and for me to feed her. I know it's not for every family or every child but I feel like God has affirmed that we made the right decision with our daughter for her. Even with transitioning her to her bed, we let her come back to our bed if she wakes up and seeks comfort at night and she is out like a light the minute she snuggles in. I have no idea if the next baby will feel the same way but whatever he/she needs to develop healthy sleeping habits, I will totally support! Casey, this post is just completely lovely! My 6 year old has a similar birth story as Aiden. 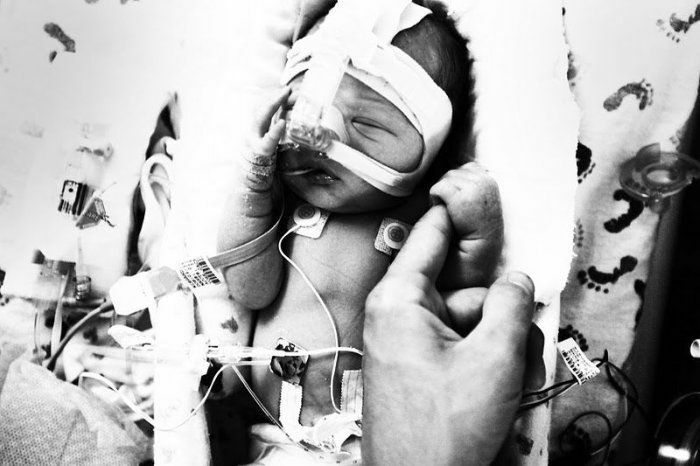 She was my 4th and I have never experienced the NICU before. It was weird not being able to care for or hold my baby. I didn't even feel like I belonged in there. I would wait till my husband came late in the afternoon and then we would go see her but not for long. We were not aware that we could sit and hang out with her all day. So many things I would do different now. We had lost time with her. When we brought her home, she would not eat or sleep unless she was held or laying down next to me in our bed. IN order for her to thrive, co-sleeping was a must. Then when she was 5-1/2 months old our family was turned upside down and because of that we did not ever want her out of our sight so she would always be in our bed anyway. My 2 year old is similar to Ains. She was born sleeping, would sleep 14 hours straight since birth and eat all the time. I agree, only we know our own families and what is best for us. Each child is different and we adapt. Thank you for sharing this sensitive subject. I LOVE that you shared such an intimate topic with us. I am a new reader but just wanted to applaud you for such a well written post on an unfortunately controversial subject. We have co-slept with our now 21 month old since bringing him home from the hospital. We didn't have plans to co-sleep, I didn't have much familiarity with it, but in responding to his unique needs, that is the way it played out for us. Looking back I can't imagine having missed out on the joy of having him with us. It is sacred. I also don't think that co-sleeping is for everyone and agree 110% that the husband has to be on board as well, but for us, it has been the right decision. I sometimes worry that I won't be as closely bonded to our next baby if he/she sleeps in a crib . . . was that an issue for you? I loved this post ! I Co-Sleep with my son but always feel bad about it when people want to know if he sleeps in his crib...I don't know why it's considered a taboo in America. Me & him sleep great co-sleeping and love it. I'm very in tune to his every move & he reaches for me at night just to know I'm there. I think co-sleeping is beautiful and to be honest when I would put him in his crib he would cry and I would miss him although we were in the same room. None of us got any sleep. We sleep a lot better co-sleeping...it works for us...maybe not for everyone but it works for me...thank u for this post I love it ! Another way to think of it like you said, you shared your story with us as to how that process of him sleeping with you started....as readers and onlookers, we only see the tip of the iceberg of your life. YOU know your life. GOD knows your life. YOUR husband knows your life. And that is what COUNTS. We are all just zoomed in on your blog and what you provide for us to know, but if we zoom out, we'd see a much bigger picture and story, just like what you shared tonight on your blog!!! It took me a couple of babies into parenting to realize that there is no "right" way to parent. I think that you have beautifully shared just that here. That you have to do what is right for you and your babies, and every kid is different. I was convinced for so long that I knew the right things to do and other people needed to figure it out. Then I had two more and God humbled me a bit :) Thanks for sharing your heart as always, Casey! love this post! and the quote from your mentor was great...i had never thought of it that way. very well put. Great long post I loved it! this has got to be one of the most beautifully written posts i've read in all my life. and i adore that about you! i am not married, nor do i have any children, but i have to say that i learned so many valuable things from this post. my favorite thing you said was, "I really do wish people would be more loving. Just understand we are all different. And be okay with that." thank you for sharing your story & for being so open with us. it means a lot, casey! i pray that God continues to bless you & your beautiful, little family. My hubby and I look at each other and smile when people say... "what if their 10 and still coming in to sleep." We are like, "so what?" One of my dear friend's has 4 kids, and she says that some nights each one will randomly come in and they are all just one big happy family. I love that. We have a queen and have been discussing getting a king since its starting to feel a bit crowded when all four of us are in there. Casey, I loved this post! I couldn't agree with you more, you need to stand firm on what works well for your family. Why should we all argue to get others to like our view or judge others for how they choose to parent their kids? It really doesn't affect us. Right? My first born, Grace co-slept with me until she was 3. She had severe colic and was never diagnosed with acid reflux until she was 16 months old. (I kept fighting for her, but no one listened to an unexperienced mom). I was afraid she would die in her sleep (my friends daughter died in her sleep) and I could meet her needs in my bed as well (nursing...etc). She is a sound sleeper and we both slept better together. She had many hospital stays due to the severe acid reflux and when I would return home with Grace, I felt better with her in bed with me. When she was three she wanted to have her own bed and room, but she still snuck in bed with me and still does around 6am :) Now that I am married and my husband is against co-sleeping (however he doesn't mind morning snuggles), I want to respect that. Our middle Olivia loves being in her own bad and sounds similar to Ainsleigh. The other night she was sick with a cold and we brought her in bed because we were worried about her, then she started jumping up and down and saying "Mickey Mouse, Hello mommy, hello daddy" so we decided that Olivia does much better in her own little crib cuddling between her blankie and mickey mouse. Our last one, Luke is much more like my oldest. He likes to snuggle and be rocked to sleep. We try to meet his needs because that is what he likes too. We never had him in bed with us unless I was nursing but we kept him in our room until just this month when he seemed ready to go to his own room. (He is sleeping much better there now). SO I totally understand both sides of the spectrum. My sister cosleeps with her two kids and hubby. They have a California King and they all sleep well together. They are happy that way and it works. Her kids seem well adjusted. So every family is different! Amen girl!!! I'm a new reader but I have to say awesome post! We are a co-sleeping household. We all just sleep better that way. We transitioned my daughter around 6 months and will probably do the same with my son (we will see), but every now and then our daughter still sleeps with us and I adore it. I love cuddling with my babies. I feel safer with them right next to me. By the way, I am so sorry about Chris's grandmother. I've been reading your blog for a long time now.. but it's time I let you know.. you've changed my life, Casey Wiegand. For the better. Thank you. This post is beautiful Casey! I love that you are so open minded. Also, I'm sorry to hear about the loss. Your family is in my prayers. Hi there! I started following not too long ago, my name is Rachel :) I really enjoyed reading this post. I'm glad you're doing what works for you and not offended by people asking questions and being curious. Really neat of you. As I read your thoughts on how one of the best gifts you can give your children is loving your spouse, I wanted to shout for joy! I think this is so spot on. In the church I belong to, there was a talk recently given on this subject that I thought you might enjoy reading. I LOVE her words and think this is truly what God would have us teach our families. i so appreciate all aspects of this post. thank you for sharing your heart and perspective. most of all, i just have to tell you, that of this entire post, the last lines were EXACTLY what i needed. being 'slower to react' is so intensely true to what i need to be working on. i've been struggling so much lately with negativity and anger, and today, in particular, i've felt convicted on this. the Lord is most definitely using your words to touch my life. thank you. My husband and I have four children. Our first baby was so hard. She hardly ever slept, so for our sanity's sake, we put her in bed with us. It was the most brilliant idea we ever had. With each child we hoped he/she would be the "good sleeper." We never had one. At one point, we had three littles in bed with us...and we only have a queen-sized bed. ;) Our third child was born with a neurodegenerative disease and is in heaven now. I'm glad we had the time with her we did (almost four years.) And I'm glad she liked being next to us. I agree with you that everything we as parents do is so very personal and that each child is quite unique. Thank you for having the courage to share. Blessings. I'm about to be a new mom and I'm so happy to read such a non-biased view of both sides. I love how you did what was best for both children. Thanks for being honest! Oh Casey, I'm so sorry for your loss. I love the note you ended on, made me really think. I am an expectant mother and I am so inspired by your approach of doing what works for each child based on their needs. I hope that I am in as in tune with my childrens needs as you have been. Agree with your post and wish people were just more loving, more supportive and really took the time to realize what works for one family might not work for another. What works for one child might not work for another. And that that is OK! Sorry to hear about Chris's grandmother. Prayers, love and hugs to you and your family. Very well written case. Thankful for you and your heart.and you are right...life is too short. We had friends lose their only grandchild yesterday in a 4 wheel accident. She was 7. Hug your babies. Love on them. We never know how much longer we will have them. absoultely LOVED this post!! you wrote it so well and said everything perfectly. every family is different and you need to adjust to each child's needs. co-sleeping, not co-sleeping, bottles, pacifiers, even crying-it-out... all those decisions are individually based and you have to go with your own family's flow! my son co-slept with us and we were way more rested and he slept way longer than sleeping in a crib. by about 9 or 10 months though he wouldn't go to sleep anymore with us and always wanted to play until 2am. we needed to get him back on a schedule and get him well-rested again because he wasn't sleeping at all so we had to let him cry a little bit. it wasn't hours and hours but it was still hard... but we prayed and knew that this is what he needed and after one night he was totally fine and sleeping perfectly! maybe that isn't what other people would do but we knew we needed to do that for our child. and we are the ONLY ones that knew what we needed to do for our child, no one else would be able to tell us because they didn't know Eli like we did. just like you said, every family and circumstance is different. i just love love loved this post!!! good job! What a beautiful post. My husband and I do not co sleep with our children. My best friend and her family do co sleep. I have always said as a mother...whatever works for you is what you should do. After I became a mom and found out how easily other mom's judge you for certain things (we let our kids have their binkies until they were 3 or didn't need them anymore) I made it my mission to be compassionate to all moms. I found your post very encouraging to all of us moms. Thanks for being so real...so honest. LOVE THIS POST! I agree that everyone needs to make the choice on their own depending on what works for them. And criticism will always be there no matter what the decision. We have always lived on the thought that we want our daughter to "be" a kid. Enjoy and do what kids need to do, and if that means sleeping with us from time to time (even though she would rather be in her bed now) that's fine! She was comfortable. We were comfortable. It worked. I co-slept with each of my babies in the early days - the only way to get any sleep at all. For us, we transitioned each of them at around 4 months or so just because we had babies that moved around a ton and it could have been dangerous. I wouldn't trade those early days for anything. I still think of them as the very sweetest. when I was pregnant with our first I thought I was going to be a scheduling parent and a cry-it-out and such. pretty much right away from when our daughter was born it just all felt so wrong to me. at the time I didn't really have any in real life support for what I felt, as all my closer friends were also young mothers with strong ideas about the "right" way to parent. so I just did what my mommy instincts told me to do with our kids, but never felt comfortable in the mommy discussions that others around me had and never really shared how we did things. I agree with everything you said in this post and if I wanted to explain to anyone about our parenting style I could easily refer them here. very well handled, thank you! Your post couldn't have come at a better time! Our little one is 4 months and weve been cosleeping. Due to a lot of pressure we tried CIO past night. It ended with us all in tears by midnight and we scooped him up and said never again. I would love some advice though. What do you do in the evenings? Wolf will only stay asleep in my arms or in bed if I'm there. I don't really want to go to sleep at 8 every night. Thank you thank you thank you! LOVE, LOVE, LOVE this post. You always have such a loving, honest way of discussing things. Thank you for your words. After reading all the comments, it's good to know I'm not as much of a rebel as I thought. :) I have always taken the "best" approaches with a grain of salt. We co-slept with my son for the first several months. And after that, he slept on his tummy. However, his preferred method is being rocked to sleep. Even though he is almost 3, he still loves to be rocked after we do stories, prayers, and singing. I have to admit some days are better than others. Some days I'm tired and he's not. Those are rough nights and he ends up crying more than I would like. I'm working on finding the right time for him to go to bed. Adjusting that has made things much better. I just love reading your heart-you truly write with such a beautiful surrender and it makes me even more excited to be a mother and steward what God has given me (we are due at the end of January). I LOVE that your husband is a priority-my husband and I are always saying we want our kids to see how much we love and respect each other first (and above all else, our Saviour). Love your words and your wisdom-way to use grace and truth, sister. Great post Casey! I'm loving this and am glad I read it. I've realized, being pregnant with my first, that you can do research and have an 'idea' of what you want to do, but when it comes down to it, it seems like you just need to feel out your child when they come. You have showed me that I don't have to have it all figured out. I don't have to be pro co.sleeping or anti. Also, I love and agree with what you said: God is first, then your husband, and then your babies. I will strive for that always. I saw my parents marriage fall apart because those 3 things weren't in the right order. Thanks for sharing so openly! I really took this post to heart. I am a nurse in a children's hospital and I see a lot of the dangerous results of co-sleeping come through my unit. After seeing these dangers day in and day out (more like night in and night out) I never understood why families co-sleep. This post really showed me the parent's side to it and why they may do it. Co-sleeping with newborns still scared me, especially with people who may be rougher sleepers. what a beautiful (even though sad) story. thanks for sharing, really!! and good for you guys that this has all worked out for you! my two kids always slept in their own beds until recently. while going thru the pains of a divorce, my 6 year old really wanted to sleep with me, and with his daddy at his house. we both felt it was his little way of knowing we were both there for him. its been about 8 months or so and he is sleeping in his own bed at dads and at grandparent sleep overs, but still with his momma! he will be 7 in jan and weve talked about him sleeping in his bed when he turns 7 and he is ok with this! i think its awesome that you guys are both on the same page and that this has all worked out for you! lord knows they dont stay small nearly long enough. so i always treausred those moments, and i pray i never forget what my newborn babies felt like on my chest!!! Thank you for being so open. And also so understanding that everyone's circumstances are different. I haven't co-slept with my babies, but you explained things so well. I appreciated your non judgemental approach. It was refreshing. From someone who is the complete opposite view on these things, it was a great post. I get how it works for your family because of your personalities etc. We let our boys cry it out and they are healthy and happy and sleep great and don't have brain problems! :) My husband and I also have a completely different view on this, so that makes sense! I loved this post. 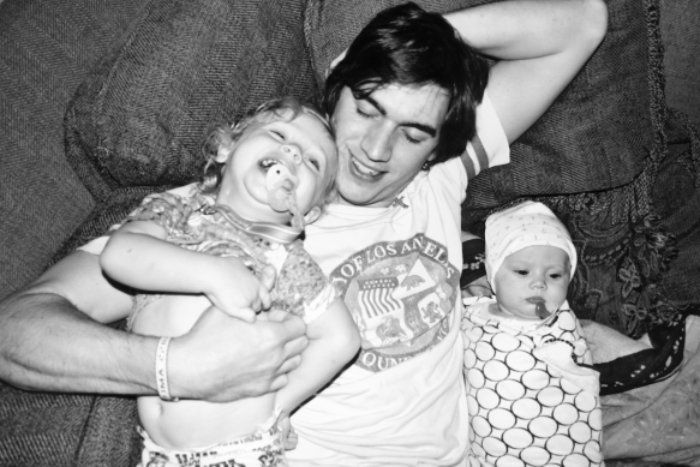 At 15 I am a long ways away from thinking about my littles, but jsut reading about all the different things that go into thinking about mommyhood really inspired me. You inspire me. Another huge thing this did for me was give me the idea to slow down. I am always so quick to think, what am I going to name my babies or where are they going to college when really I should be thinking about where I am going to go to college, or about who I am going to be having my babies with. I guess I was just quick to forget that my future husband will always be number one next to god....not the littles, although they come close behind. Thanks for slowing me down! My heart and prayers are with you and your family as Chris goes through this time. Blessings Case. Thanks for your always wonderful insight. Beautiful. Everything you say is so non defensive or judgmental. I love that you aren't defending yourself just speaking. That is a lesson that so many of us need to learn. Thank you for sharing your story and giving me perspective. 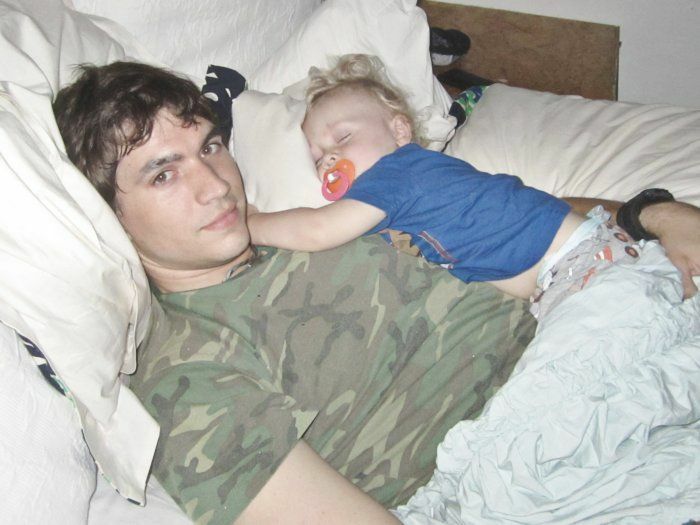 I can't imagine co-sleeping. I also can't even begin to imagine what it must have been like to hear silence... I am humbled by your post. I really enjoyed this post. Its sad that people judge each other on this topic. I always tuck my little man (2 years old) into his own big boy bed. Sometimes he stays all night, sometimes half a night & sometimes he just goes straight to my bed. Your right, one day he will be older & will not want to sleep with me anymore. I know this doesn't have to do with your post, but I just want to say you guys are the cutest couple and have THE cutest babies ever. What an amazing post! So honest and open about your life and so much love to give to so many people! I pray for all the kind souls that have left us (we lost my husband's grandfather this past week as well) so that they may find peace and become our guardian angels (I will include Chris' grandma in my prayers). Happy Holidays to all the Wiegands! wow, thank you so much for sharing this. we've been co-sleeping with our daughter now for month or so, and it's been a very positive experience. we haven't received much criticism yet (but then again my mom doesn't know yet!) but your post definitely helped me feel more confident in our decision. this parenting this really is all about what is right for each family/child. This was such a beautiful and loving post. I love your tenderness to your babies and their needs. I am so grateful to see someone else who co-sleeps and has had a positive experience with it, along with a child who doesn't want to co-sleep. I wonder what we will do with our next baby, and what we will do if Ems is still in our bed then. It doens't matter to me, and my husband and I just love having her so close. And, like you said, there are plenty of other places to be alone, and plenty of time to be together in the future. We only have right now. This has been such a help to me since the moment I read it. It's truly convicted me. I will parent the way I believe God is leading me and my husband to parent and not the way other people think we should. My identity is found in Christ and not in what others think or say. Thanks for sharing this Casey! We don't have children yet, but just reading how your family handles and goes through things gives us things to think about so that when the time comes we have an idea of what to expect. I appreciate that. Thank you! Just a wonderful post!! You said it best, we need to do what is best for each individual child and I truly believe as moms we really do know what is best! Thank you!!! Jon, my hubby, and I don't have kids yet but we do cherish our sweet French bulldog like he's our baby! We always said we wouldn't want him or babies sleeping with us and now Ernie sleeps cuddled right next to me every night, I love it! I will be anxious to see what happens when we have human babies. I am a true believer in certain things working for some people and not for others! What is this quote from? "Living your life to get that deep God-like validation from your peers is a scary place to be in" I love it. I also love this post. You take a stance that I wish more people would take. The acknowledgement that mothers and fathers know their babies best. Regardless of what books or other people say... and that we all need to trust our instincts... even if they change from one month to the next. Thank you for this post. Thank you thank you thank you for writing this. We are the parents who agree that co-sleeping is okay for our baby girl, but constantly feel the need to hide it from everyone in fear of judgment. I want Dylan to feel comfortable in her own room, but if she wakes during the night and wants to just cuddle with us, we have no problem bringing her in. We know she'll only be this small once. Thank you for the informative link from Dr. Sears as well. All of this really brought me a peace, and less guilt that I'm doing something "wrong" that will have a negative impact on her. It reinforced that as long as she feels comfort, stability, safety... I'm doing okay as her mama. i love this post. there's just the feeling of relaxation...no condemnation if you co-sleep. you just have to be flexible, and you've done that with both individuals asking you AND your children. I can't imagine not co sleeping. I love having our daughter next to me and it makes me and her feel safe. These are years we can never get back, I love cuddling with her while she still let's me! I loved this- just letting them be little while they're little. Sometimes this world tries to force us into things we're not ready for, especially when it comes to babies and all of the technology out there (and the "deadlines" for when they should be doing this or that). I love that you have such a simple, pure approach to parenting...I hope to reflect the same with our babies some day. Thank you for sharing and answering all of the questions with such grace. That photograph of you and baby Aiden....His chubby little cheeks and curly hair. It brought tears to my eyes. It reminded me of my sweet Kado. This is such a sweet post.